William Shakespeare – whose literary masterpieces have transcended time and geographical boundaries – would have been 451 years old this week. UC Irvine’s new Shakespeare Center is celebrating the playwright’s work with performances, festivals and academic discussions. Led by Julia Lupton, a UCI professor of English and a trustee of the Shakespeare Association of America, and Eli Simon, UCI Chancellor’s Professor of drama and artistic director of the New Swan Shakespeare Festival, the center will build on existing partnerships between the Claire Trevor School of Arts and the School of Humanities and aims to become the state’s premier institution for the integrated production, study and enjoyment of Shakespeare’s plays. Launched with funds from the School of Humanities and Full Fathom Five, a group of donors that includes several UC faculty members, UCI’s Shakespeare Center will be administered by the Humanities Commons in cooperation with the Claire Trevor School of the Arts. Shakespearean scholarship and performance at UCI is as old as the university itself. Founding dean of fine arts Clayton Garrison directed “A Midsummer Night’s Dream” with the campus’s first class of drama students in 1965. 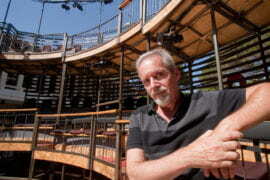 Forty-seven years later, the Claire Trevor School of the Arts introduced the New Swan Shakespeare Festival, which stages two plays each summer in an intimate outdoor venue modeled on an Elizabethan theater-in-the-round. UCI has been home to many distinguished Shakespeare scholars, including Robert Montgomery, James Calderwood and Robert Weimann, and for nearly a decade has sponsored the dynamic Group for the Study of Early Cultures – a research-based assembly of faculty and graduate students that has supported numerous Shakespeare-focused events since its inception. Here, Lupton and Simon discuss the Bard of Avon, the new center and their big plans to promote Shakespeare at UCI. Currently, the arts and humanities work together on a number of interschool initiatives, including Illuminations and the New Swan Shakespeare Festival. How are you hoping a center will leverage, or further, these partnerships? JL: We’ve been operating like a center for several years now, thanks to the synergy of the New Swan Shakespeare Festival and the research activities of the Group for the Study of Early Cultures. Illuminations is helping us build out the cross-campus, undergraduate dimension of everything we do. Becoming a formal center is the natural next step. ES: Yes, having a center will give us a clearer identity on campus and in the region, and it allows us to reach out to new audiences. You both have planned ambitious activities for the center. What are you most excited about, and why? ES: It’s always exciting to bring leading scholars into the center of a Shakespeare festival like ours. We’re embedded in a top-tier academic community, so it makes sense to engage our audience in critical discussions about the plays, characters and themes in these amazing works. Seeing the audience enter the New Swan Theater is always thrilling for me. The synergy between the performers and audience is palpable; this is what makes our festival so special. JL: Supporting the New Swan Shakespeare Festival with academic enhancements has become the highlight of my summers since the festival was launched three years ago. I’m also excited about academic-year events, like working with Jane Page on Shaken Shakespeare, a roving performance troupe that brings bursts of Shakespeare to spots all over campus. Look for the kids with the yellow shirts; they’re ready to “Shakespeare” you! What’s your favorite work by Shakespeare, and why? JL: I have a deep affection for his later plays, especially “The Winter’s Tale.” Seeing “Twelfth Night” in rehearsal and performance last summer really astonished me, though. It may be one of Shakespeare’s most perfect plays. ES: My favorite work is always the one I’m working on right now. So I can say, without hesitation, that it’s “Macbeth.” I find this to be one of Shakespeare’s most accessible stories. I love the witches, and I’m figuring out ways to weave them into the fabric of the play. It’s so much fun to delve into the mysterious tug of ambition – and to watch sheer evil take shape in the heart and mind of Lady Macbeth and then her husband. A recent study conducted by the American Council of Trustees & Alumni found that only four of 52 top-ranked universities require English majors to take a course on Shakespeare. What’s your reaction to this? JL: Shakespeare is alive and well at UCI! Although the English department has never required a Shakespeare course per se, his plays often appear in Humanities Core, literature and drama classes, and they’re frequently performed on the many stages of the Claire Trevor School of the Arts. Through courses, lectures, workshops and performances, the new center will amplify Shakespeare’s presence across campus. Let the revels begin! How do you explain Shakespeare’s timelessness? JL: For me, it’s the balance of myth and realism. You get these archetypal stories – many of them with analogues across the globe – that have a real pull on our minds and souls, and then Shakespeare makes those myths incredibly real by crafting living, thinking, loving, lying characters who become our confidants for a while. ES: I’m consistently staggered by Shakespeare’s humanism. He understood people, and I conjecture that this is why people love his plays so much. When you watch one of his plays, you feel as though you can relate to the characters that inhabit those worlds. You think, “I know what she’s going through. I’ve been there myself.” Even the villains are given their due. Think about Shylock and his “Hath not a Jew eyes?” speech. Shakespeare stepped into his shoes and looked at the world through his eyes. This is why his works are timeless. Why is it important for students across disciplines to learn about, experience and/or perform Shakespeare? JL: In Shakespeare’s plays we see the English language exploding with new words, metaphors and ideas. Learning to read Shakespeare really stretches the mind and the imagination. Studying Shakespeare is a form of time travel that brings his world and ours into contact. ES: When we watch his plays, we learn about the fundamental conditions of being human and how differing people – from kings and queens to servants and children – react to divergent circumstances. Shakespeare can clarify for us what is worth fighting for in our lives and what we might aspire to in our dreams. Under the umbrella of the center, Lupton and Simon are working together to bring UCI and the Orange County community a number of Shakespeare-centered activities and innovations, including research partnerships with the Huntington Library, UCLA’s Clark Library and the Folger Shakespeare Library; workshops and master classes with visiting actors, directors and designers; thematic programs in drama, law and medicine; and an endowed chair in Shakespeare studies, jointly supported by the English and drama departments. 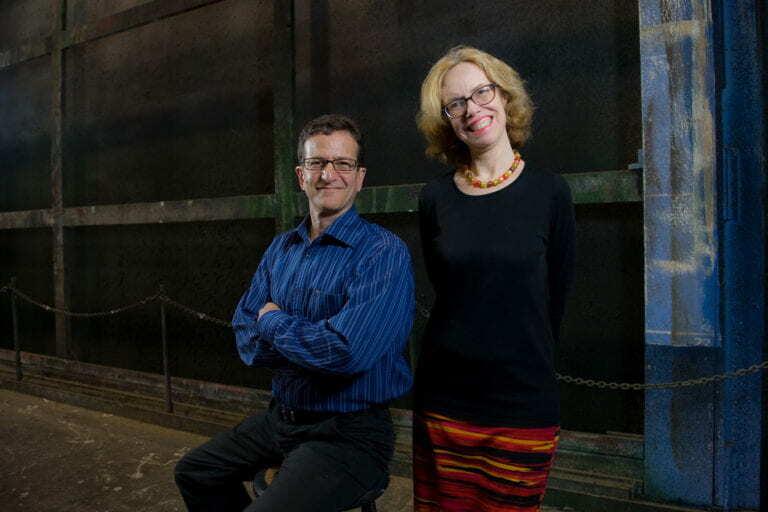 New Swan summer preview: Eli Simon and Julia Lupton preview the New Swan Shakespeare Festival’s summer season at the University Club. Shaken Shakespeare: Sponsored by Illuminations and directed by Jane Page, a roving band of thespians deliver snippets of Shakespeare at random locations across campus. If you see kids in yellow T-shirts, prepare to be “Shakespeared”!